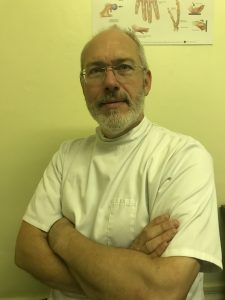 Our Principal Osteopath and Clinic Director, Robert Hopkins BSc(Hons)Ost, graduated from the University College of Osteopathy in London in 1996 with a First Class Honours degree and he was awarded the Gold Medal for outstanding academic and technical achievement, one of only two awarded that decade. Robert has worked in private practice continually since qualifying and prior to moving to Spalding in 2006, he worked as an associate in clinics in London and Essex and as a Partner in a multi-disciplinary practice in East Yorkshire. His main interests in Osteopathy are the treatment of the postural problems associated with pregnancy and the use of Osteopathy to treat the symptoms of asthma, an area in which he has carried out preliminary research. Robert is also a trained musician, having graduated from the London College of Music in 1980, and he has extensive experience in treating musicians and patients with a performing arts background. He is trained in the Niel-Asher technique for treating frozen shoulder and performs the Epley manoeuvre for the treatment of vertigo.